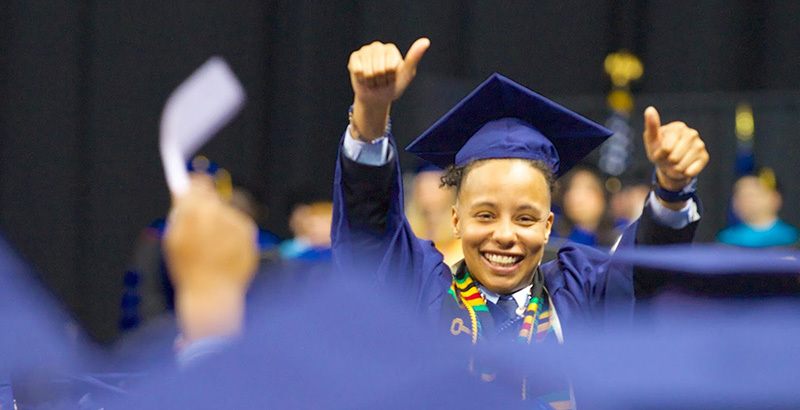 More than 700 of Tidewater Community College’s 1,500 graduates weathered a rainy Saturday morning to walk in a graduation ceremony with a military flair held at the Ted Constant Convocation Center. TCC President Edna V. Baehre-Kolovani saluted both the Class of 2017 and the Navy in TCC’s 64th Commencement Exercises. This year marks the Centennial of Naval Station Norfolk. Fittingly, both the keynote speaker, Capt. Rich McDaniel and student speaker Megan Roche shared Navy ties. 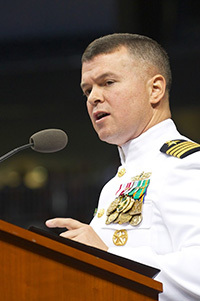 McDaniel is commanding officer of Naval Station Norfolk, roughly 3 ½ miles from the Constant Center. A University of Memphis graduate who was commissioned in 1992, he reflected on life lessons from his personal journey. “Your success will depend on you alone,” he said. “It’s not the government. It’s not race, gender, socioeconomic status, religion or anything else that will determine or detract from your success. McDaniel encouraged the graduates to maintain a high work ethic and a good attitude. Roche, a fire controlman in the Navy, used her GI Bill benefits to complete her Associate of Science in Science. She is among the 12,000 military-related students who attended the college in the past academic year. That’s roughly 35 percent of the college’s enrollment. President Kolovani also recognized the inaugural graduates of the college’s Accelerated Degree Program in General Studies. Instead of taking the traditional two years to earn an associate degree, these graduates will finish in June after completing all 61 credits in just one year. 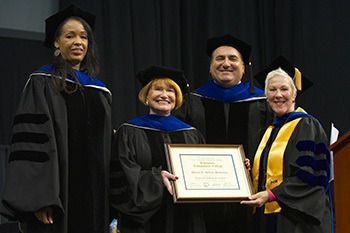 Prior to the awarding of student certificates and degrees, Dorcas Helfant-Browning, principal broker and managing partner of Coldwell Banker Professional Realtors and a longtime higher education advocate, received an honorary associate degree. Helfant-Browning served two terms as chair of the Tidewater Community College Board and is the current chair and treasurer of the TCC Real Estate Foundation Board. 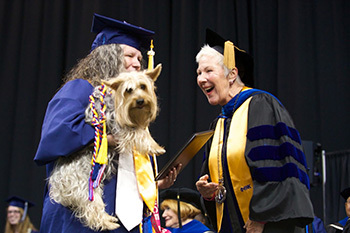 After the conferring of certificates and degrees, each graduate received a pin from TCC’s Alumni Council and joined a network of 80,000-plus alumni.